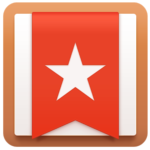 Wunderlist is a simple to-do list and task manager application that helps you get organized. It can be used to create and manage various to-do lists. The lists, such as a grocery list or travel packing list, can be shared with and updated by others as well. Images and files can be attached plus due dates and reminders can be set to help you with deadlines. This App instantly syncs between phones, tablets and computers. Available on all types of devices even Kindle Fire.